You shouldn’t have to worry about data backup. It should just work. No data limits, no throttling, no worries. 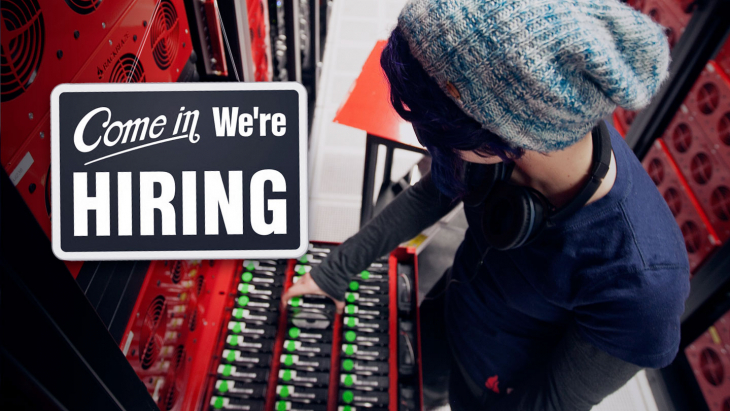 That’s Backblaze. 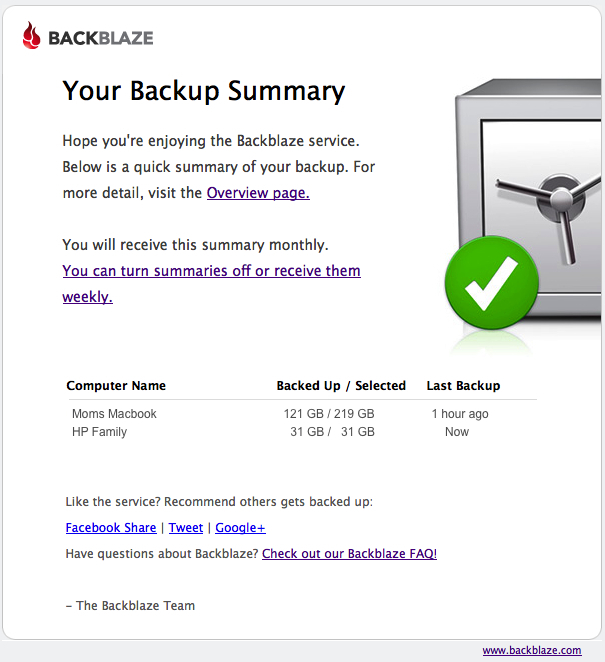 Here’s a look at what’s new in Backblaze Online Backup Release 2.5. 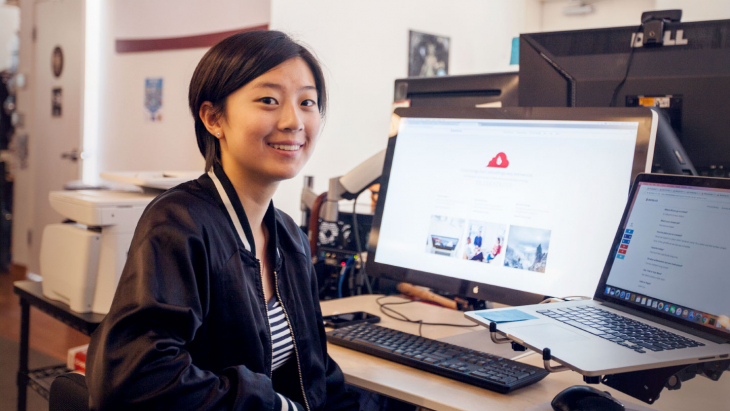 From any web browser you can log in to your Backblaze account to see how things are going. Most of the time when someone logs in, it’s to do a restore, but on the “Account” page you can; adjust your account settings, check out your billing information, change your password and more. 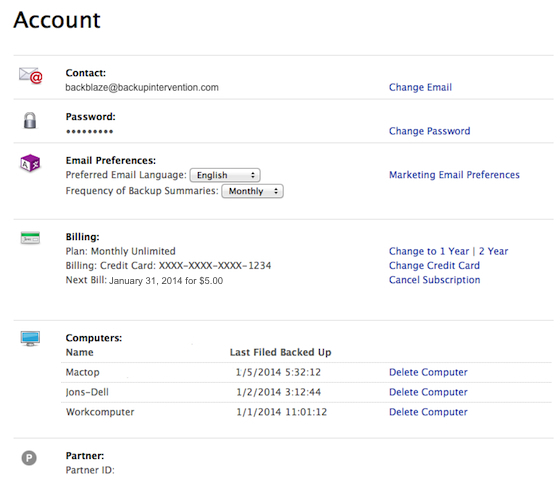 For 2.5 we reorganized the Account page so you can understand your account at-a-glance. For example, all your billing related information is in the same place and it is easy change plans, change credit cards, etc. One of the things we realized is that many customers use our system for years and never log in to their account. 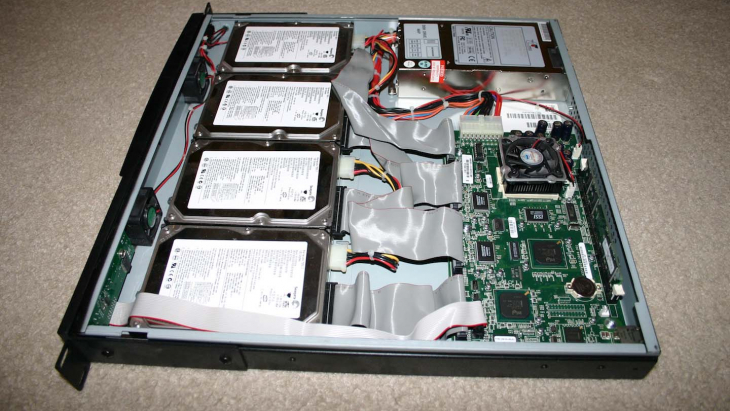 But sometimes something goes wrong; an external drive becomes disconnected or fails, or a customer changes computers and turns off the old one. Things happen. 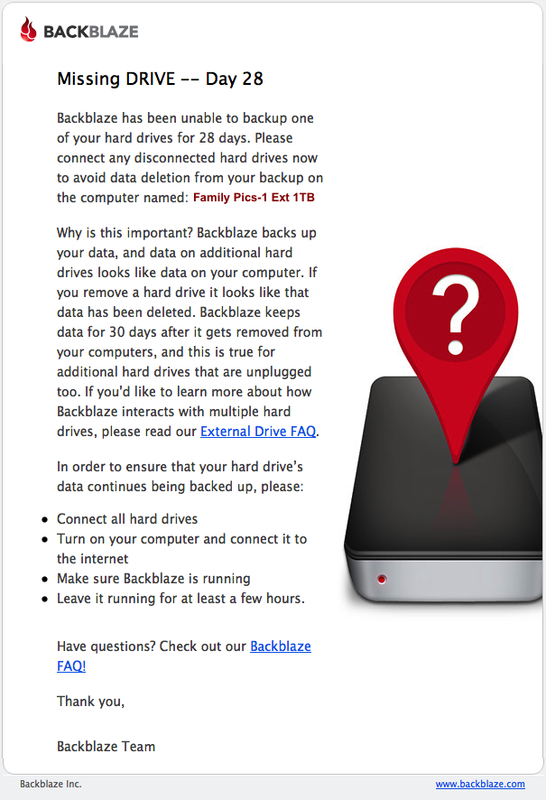 So when we see something amiss we’ll send a notification email to your Backblaze account email. We Miss Your Computer — If we can’t communicate with a licensed computer for 14 days, we’ll start sending you emails like the one below. A Drive is Missing — We back up the internal and external drives that you’ve selected. If we can’t communicate with one of those drives for 14 days we’ll start sending you emails like the one below. Some people are content to “let the backup happen,” while others watch the Backblaze Preferences panel as the number of files to back up counts down to zero. OK, maybe they don’t watch that often, but they do want to know how things are going. Fair enough. With Release 2.5 we will send each Backblaze account owner a Backup Summary email like the one below. 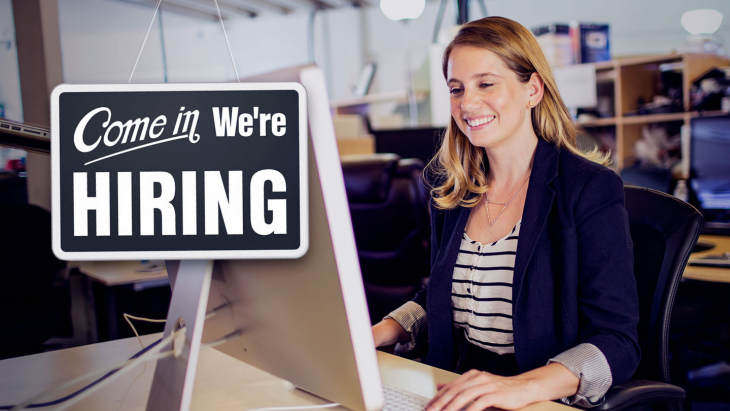 You can choose how often you wish to receive this email: monthly, weekly, or not-at-all. This is set on the Account page. 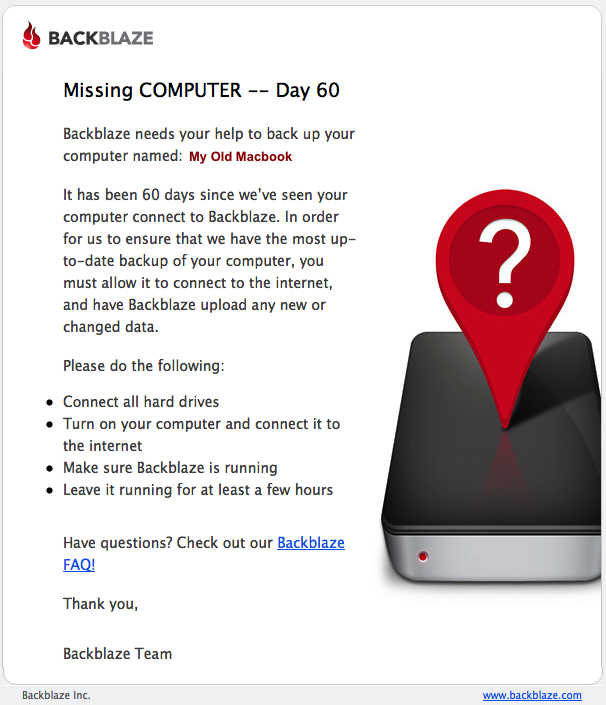 The email provides a snapshot of the status of the computers in your Backblaze account. 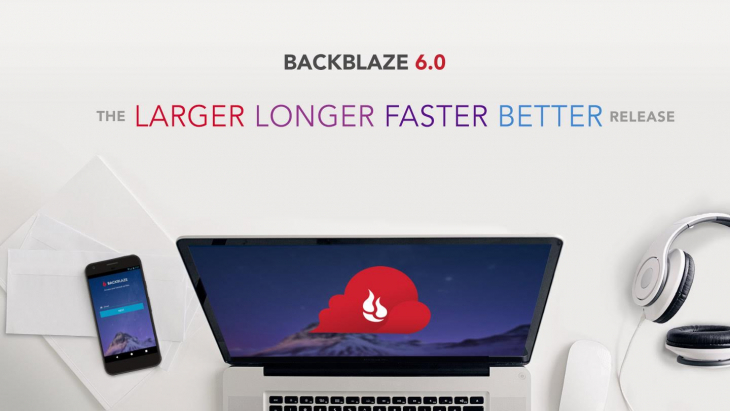 Backblaze customers could previously backup a file that was unlimited in size, but the default was set to 4 GB in the Backblaze Preferences for a given file. Beginning with Release 2.5 the default will be Unlimited. We’re not sure why anyone would want anything else, but we are leaving the ability to limit the file size just in case. Of course our engineers tinkered with plenty of things a typical Backblaze customer doesn’t notice. For example, in Release 2.5 our Client Engineering team doubled the speed of the file scanner that compiles the list files to back up. This is most evident during the installation process when we do our initial file scan of your hard drive. We also improved how we back up .emlx and .ics files on the Mac and changed over to use the newest Xcode 5 build environment from Apple. With Release 2.5 we’ve made it easier to stay up to date with your Backblaze account. We hope this brings a little more tranquility in to your life. We will be auto-updating everyone in the next few weeks, but if you can’t wait you can upgrade now, it’s pretty cool.